Established in 2014, SPRING1883 is a new and exciting hotel-based art fair, presented at The Hotel Windsor Melbourne. Hugo Michell Gallery is pleased to be presenting the work of William Mackinnon, Lucas Grogan, Elvis Richardson, Toby Pola, Tarryn Gill, Richard Lewer, Will French, Tony Garifalakis amongst others for SPRING1883. Artists have been selected for their ability to respond to their surrounds and to complement a domestic interior. Elvis Richardson will transform the living room, revisiting her ‘Trophy’ series where she further develops her conceptual practice, studying memorialisation, lifestyle, death and taxes. 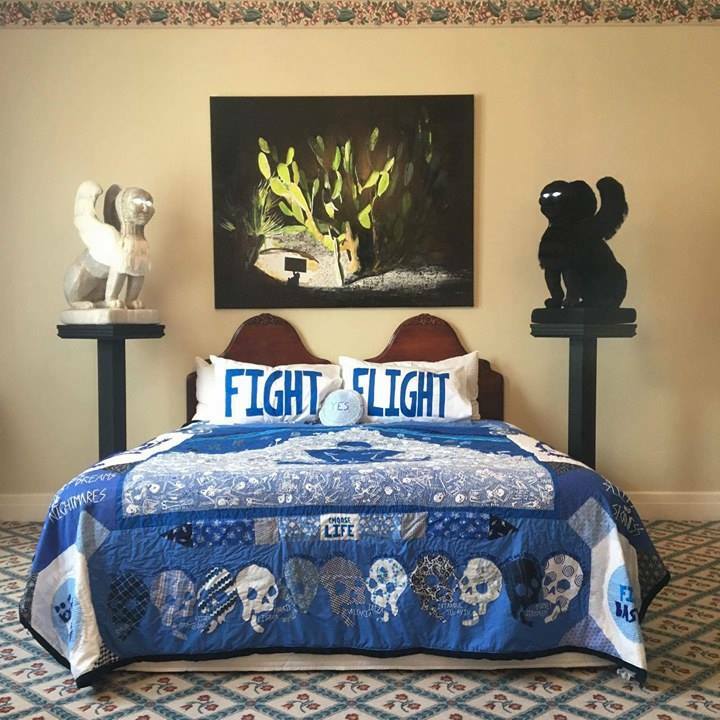 In the adjoining bedroom, Lucas Grogan presents an intricate hand-embroidered quilt, 18 months in the making. Fabricated during his travels across Europe, Asia and the South Pacific, this quilt is a reflection on and reaction to his personal experiences and the wider human condition. Off the back of her hugely successful series exhibited during the 2016 Adelaide Biennial of Australian Art: Magic Object, Tarryn Gill presents a large-scale totem pole referencing legends, folktales and the uncanny. After his sell-out show at Hugo Michell Gallery in February, William Mackinnon will exhibit a new body of work for Spring 1883, observing themes of home, coastal Australia and journeys physical and psychological. Toby Pola’s work plays with our perception of material through a honed understanding of woodcarving. The works for SPRING1883 reflect Pola’s sense of irony and highlight the site-specific nature of the exhibition. Visit us in Room 124 from Thursday 18 – Sunday 21 August. See SPRING1883 website for full details.